Wordpress is an awesome platform on which to base a website or blog, as it's easy to set up and customize and offers a lot of quality templates. But one of its best features is the availability of hundreds of thousands of plugins for your site, which gives you the power to do just about anything you or your brand would need on your website. Thanks to the Juicer plugin, it's never been easier (or cheaper) to get an aggregated social media feed up and running on your Wordpress site. You'll need to get signed up to Juicer first, which is very easy (and free). 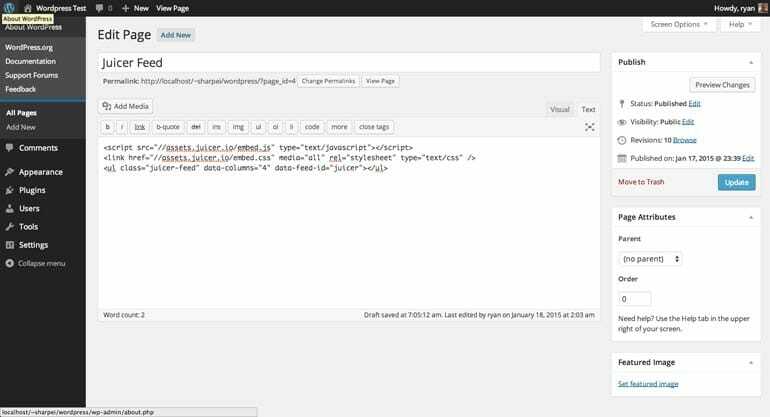 In your Wordpress dashboard, create a new post or page, or edit an existing one. Then, click on the "text" button above the content editor. And paste your embed feed into the page, as shown below. Remember that your specific Juicer embed code is available on your Juicer dashboard, by clicking "Embed In My Site." Simply save that page, and you'll have yourself a shiny new Juicer feed! Next, log on to your Wordpress admin dashboard, click "Plugins" in the left-hand menu, find the Wordpress plugin in your list and click "Activate." Save the page and voila! You now have a Juicer feed on your site. Use a Juicer PHP Function to Embed Directly In Your Theme. If you're into the "nitty gritty" of customizing the PHP code of your Wordpress theme, it's easy to integrate Juicer this way, too. For example, if you want to get a Juicer feed on every page, you can add the juicer PHP function to your footer.php file in your themes directory. 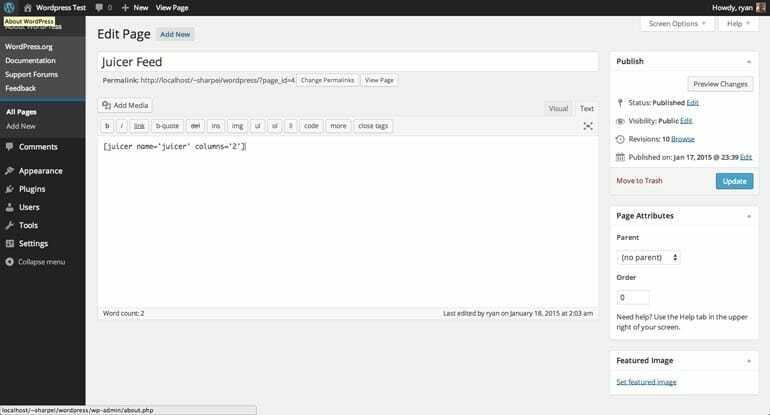 First, install and activate the Juicer Wordpress plugin as described above. Then, use the Juicer PHP function anywhere you like in your template. To get the exact PHP function, visit your feed editor page, click on "Embed In Your Site," and then click "I have a Wordpress site."